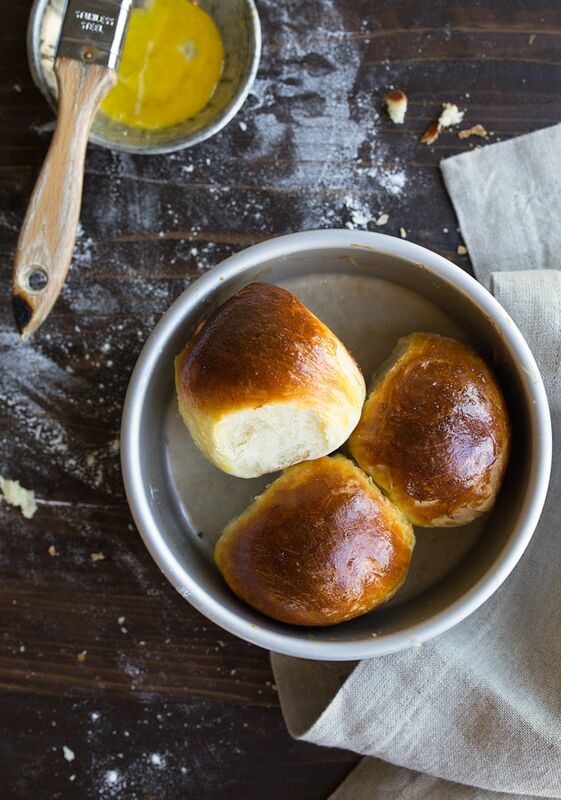 Small batch dinner rolls for two. Recipe makes 4 rolls. Our journey for small batches of bread, both with and without yeast, has culminated in this small pan of dinner rolls. Lean in close, this is as good as it gets. This is the best thing you can do with a packet of active dry yeast. 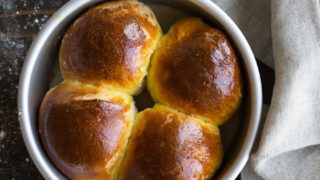 This recipe for small batch dinner rolls for two is so perfect because they’re light and fluffy, exactly as they should be. They’re packed with that slightly sweet yeasty flavor; that coveted dinner roll flavor makes me soon. Slathering them in butter is the only natural thing to do as soon as they come out of the oven. Dinner rolls are a bit of a thing in my family, and no Sunday dinner is complete without them. In the small household, on weeknights, I’ve been resorting to frozen bread rolls. Using frozen rolls is the only way I can get the portion control I need, because I don’t want to throw away leftover rolls that have gone stale or worse, moldy! But now that I have this small batch dinner roll recipe, I can make 4 rolls on a weeknight to accompany soup. I made them last week to go with my green chile chicken stew, and I’ve also served them with my Zuppa Toscana for two. It looks like I need to work on my breads made without yeast category, right? I’m always open to any recipe suggestions or requests you have, too! First, whisk together the flour and salt, and place them in a small bowl. Then, bring the milk and honey to the proper temperature either in the microwave or a small sauce pan, 115-degrees F. Stir in the yeast, and let sit until foamy, about 5 minutes. Add one egg yolk and the melted butter. (This recipe uses two egg yolks; for recipe ideas using the leftover egg whites, try my egg white only recipes category page). Add the wet ingredients to the bowl with the flour, and stir until a soft dough forms. 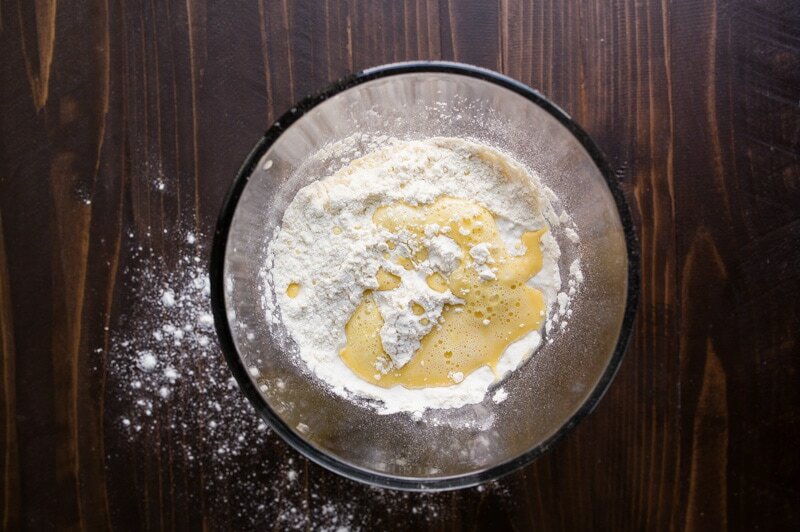 Flour your work surface, and bring the dough together into a small disk about 5″ across in diameter. This dough will go back into the bowl you mixed it in, and will rise until doubled in bulk. 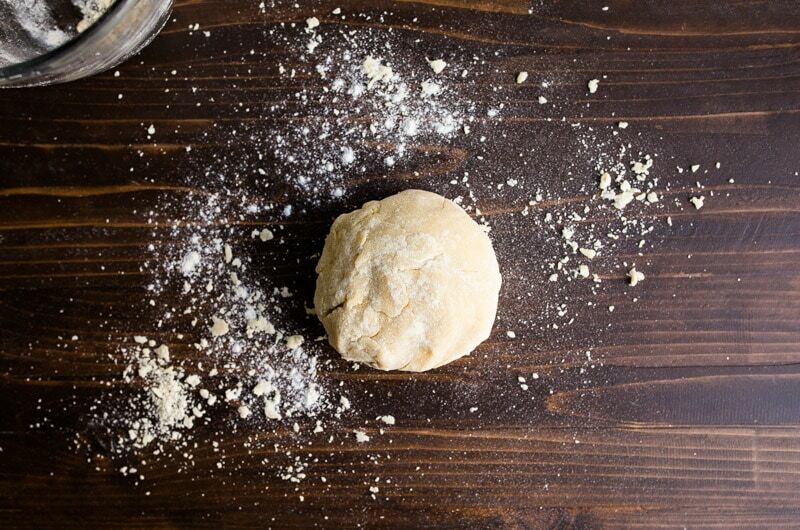 After the dough completes its first rise, it’s time to shape our rolls. Cut the dough disk into four equal pieces, and roll each dough into a ball before placing it in a 6″ round cake pan that you spray with cooking spray. Let the dough balls rise in a warm place until doubled in size, about 1 hour. I use the ‘PROOF’ setting on my oven and it takes about 30 minutes. Brush the remaining egg yolk over the rolls before sliding them into a 375-degree preheated oven. Bake for 18-19 minutes, or until golden brown. The egg yolk on top will help them turn a lovely shade of golden brown, just like bakery rolls! Let cool in the pan for about 5 minutes before dividing and enjoying! 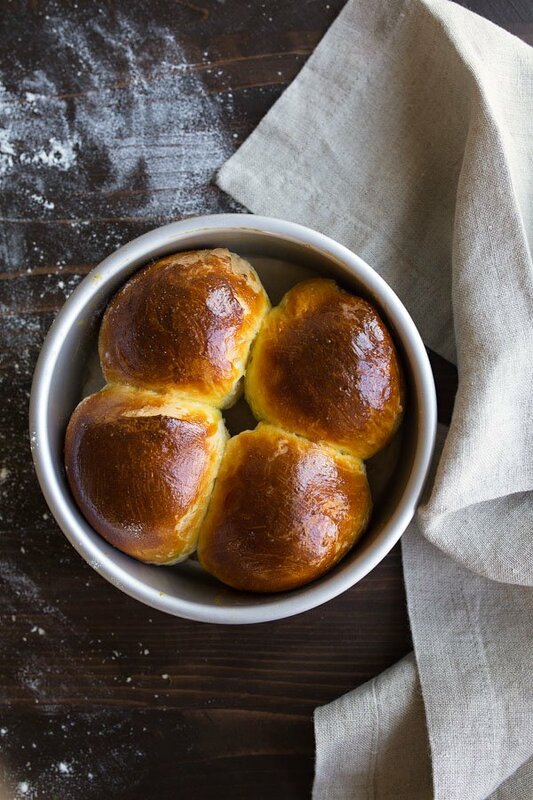 If you have Thanksgiving for Two plans this year, these small batch dinner rolls are a must! Small batch dinner rolls for two. In a small microwave-safe bowl, add the milk and honey. Heat in the microwave for about 20 seconds until the temperature is 115-degrees F. Alternatively, heat in a small saucepan on the stove. Whisk to dissolve the honey into the milk. Stir in the yeast and let rest until foamy, about 5 minutes. Stir in one egg yolk and melted butter. In a separate bowl, add the flour and salt and stir together with a fork. Pour the wet ingredients on top of the flour mixture, and stir until it starts to come together. Knead the dough for a few minutes in the bowl, it will be sticky and pliable. Cover and let the dough in the bowl rise until doubled in a warm place. Once its doubled, preheat the oven to 375-degrees F.
Divide the dough into 4 equal pieces, and roll each piece into a perfect ball. You can pinch from underneath the dough to make the top perfectly smooth, but it’s not necessary. 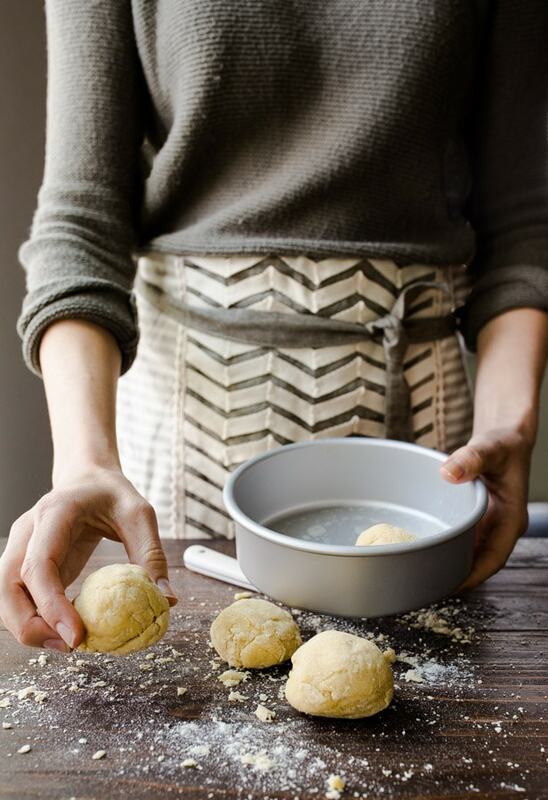 Place the dough balls into a 6” round cake pan that has been lightly sprayed with cooking spray (or use a muffin pan). Let the dough rise again while the oven preheats. Ideally, the dough balls will be puffy and touching each other before they go in the oven. 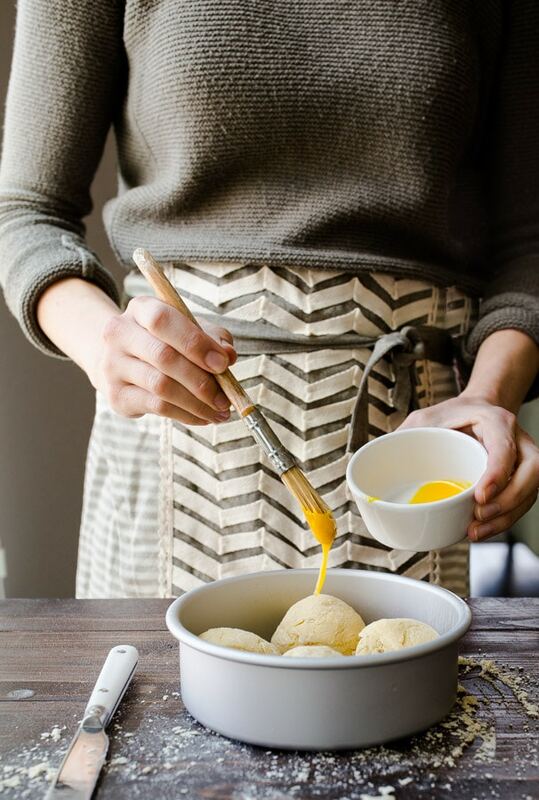 Brush the dough with the remaining egg yolk. It should take about 30 minutes in a warm, draft-free environment. Bake on the middle rack for 18-19 minutes, until golden brown. Remove them from the oven and let them cool for about 5 minutes before tearing apart and serving. Great idea. My go to is King Arthur Amish Rolls,But even in half it makes too many. Thank you for doing the creative work. In reading through your recipe, the numbered steps have you cover and rise prior to splitting into four balls, but when reading your post above, it looks like you split them first. Which do you think is best? I must. Many thanks to you, & I so enjoy your Blog. I love that it only makes 4 rolls so you’re not wasting any food – which I hate as well. And they seem fairly simple to make, too! I’ve made these as written and they’re great! This time I used molasses instead of honey, and half whole wheat flour and half regular flour. Instead of a second yolk, I brushed them with milk (I was running low on eggs!). I divide them into 6 instead of 4 (there were 3 of us for dinner), and they were done right at 18 minutes in my slightly cool oven. A little bit more dense but delicious! Next time I’ll probably nudge the flour proportions a bit so that there’s more white flour. Im looking forward to making these in the future! They look delicious!